be a taxi rat run. Now bikes and pedestrians only. The City of London will be hosting a Cycling Forum on Tuesday 2 July 2013 and invitation is open to anyone who would like to attend and who has constructive comments to make about cycling in the City of London. The event is hosted by the City of London and will take place at the Green Box Community Hall, 14–16 Little Somerset Street, E1 8AH. It will commence with light refreshments from 5.30 p.m., with formal business starting at 6.00 p.m. and will conclude at around 8.00 p.m. If you read this blog and car about the future of cycling in the City of London, please please make an effort to attend. It's a really good opportunity to raise issues and make your voice heard. As I mention above, there's no need to RSVP, just come along on the night. The agenda for the evening contains three elements: Aldgate gyratory proposals; the City's response to the Mayor's Vision for Cycling in London; and cycling questions and answers from the floor. I thought it would be useful to give my own potted summary of things that I think are going well and going less well in the Square Mile. Firstly, let me start with things that aren't going so well. And top of that list is the plan for the removal of Aldgate gyratory. I first previewed the plans for Aldgate back in April. Firstly, it's important to note that I think it's brilliant the City is going ahead and removing this horrible gyratory system. It's horrible on foot and horrible on a bike. The City has amended the original plans quite considerably since I reviewed them in April but they're still not good enough. The real bugbear is that the City is proposing to spend tens of millions to narrow the road at several points creating really serious pinch points for cyclists who will have to merge into narrow lanes with the masses of rush-hour coaches and heavy goods vehicles that drive through this area. Of particular note are two elements: a) the police check pinch point where bikes, coaches, lorries and taxis will be funnelled into one narrow lane shared by all just as you enter the City of London and b) the way the carriageway is going to ebb and flow (a bit like the truly awful Southwark Street) so that one minute you have clear space for cycling, the next you find yourself having to shove yourself in front of a long distance express coach. The pavements will be made excessively wide at points for no real benefit to anyone. You can review the earlier plans at Aldgate and make your own mind up but I although I agree that the City has made some positives changes to its original plan, I still think both of these factors need addressing. And they need proper solutions, not more tinkering. been created the length of Cheapside? There's been some welcome news at Bank junction, one of the worst danger spots in the Square Mile where the City has come up with some impressive plans for the area and ways to make it function better for the vast majority of people who use it (who are on foot, on bike or in buses and definitely not in private cars and vans). There is much much discussion, however, about whether some streets around Bank (and elsewhere in the City) should be narrowed to create wider pavements. This would have the effect of turning very many roads into Cheapside-style environments: massively wide pavements and narrow road lanes. So narrow in fact that when the traffic is flowing, motor vehicles brush past you with inches to spare and when the traffic is at a standstill, you simply can't cycle as there's nowhere to go. You just have to sit behind a bus and breath in the fumes. 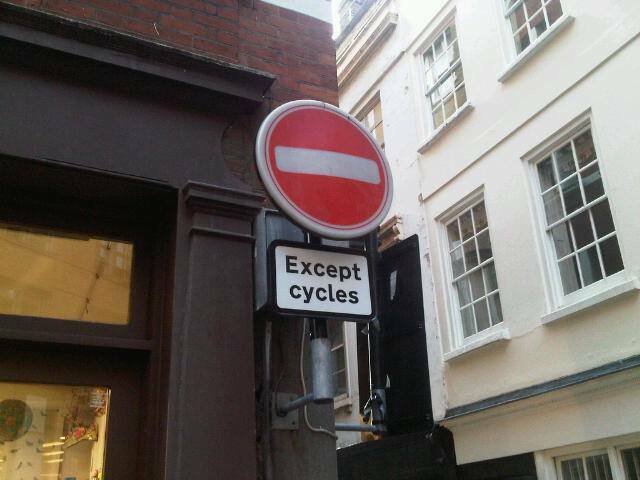 The City has now formally acknowledged that narrowing roads to the same extent as Cheapside is not going to encourage people to cycle. Some of the original plans are truly awful. 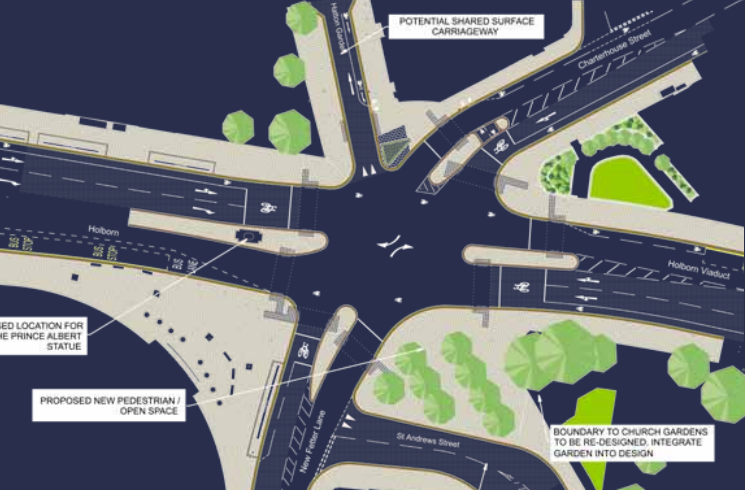 The plans over at Leadenhall Street would have made this route unusable on a bike and the City even expressed an utterly unacceptable desire to "encourage" people to cycle through "quieter routes" in Hackney and Islington rather than through the Square mile at one point. That statement has not been formally reversed but the City has at least formally acknowledged "cyclists do not want narrower carriageways ...as they feel this would impact on their safety". We need to be doubly sure that excessive road narrowing such as at Cheapside doesn't creep in on any of the very many road schemes planned all around the Square Mile. 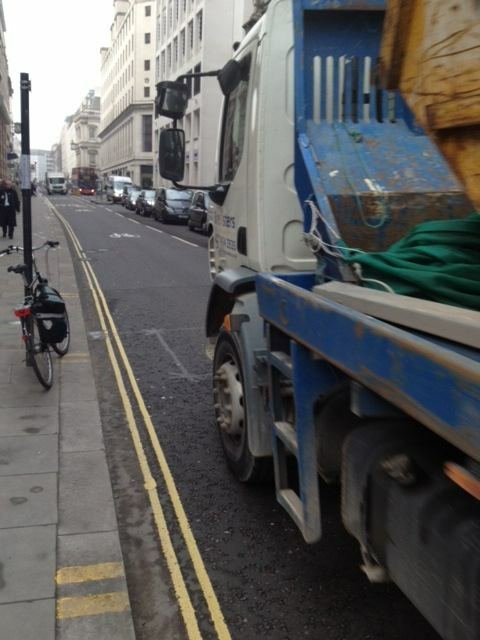 One area where the City of London deserves an absolute tonne of praise is in its policy of opening two-way cycling on previously one-way streets. 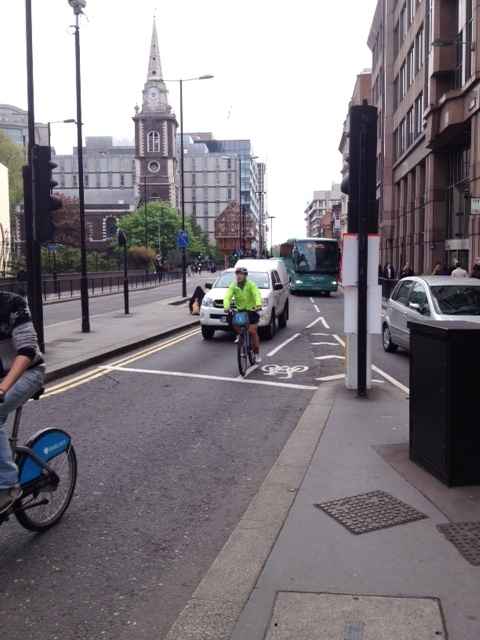 The City has now opened up a whopping 50 contraflow cycling streets all across the Square Mile with a further 10 being added over the summer. The City reckons that cycling has increased at least 60% on these streets but there has been zero increase in road casualties. 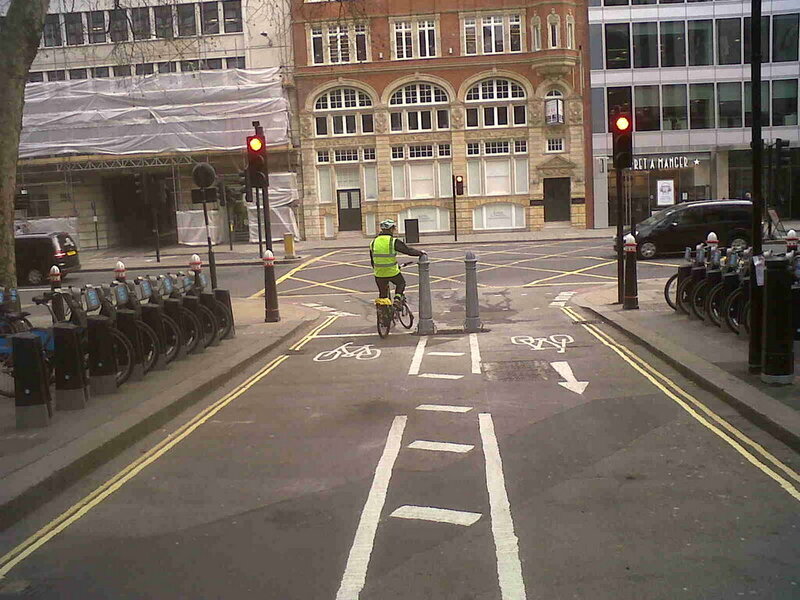 This has made whole areas of the Square Mile massively easier and safer to get about by bike. 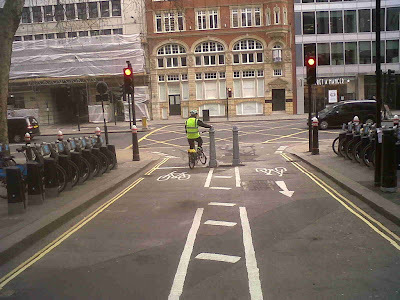 Areas around Fenchurch Street station and north of Cheapside are now pretty much all two-way for cycling and you can take safer, easier and often quicker routes by bike that were unimaginable a couple of years ago. The City of London jointly won a London Cycling Campaign award for this scheme and I think it's a fantastic, low-cost but high impact scheme that's had brilliant results. One scheme that gets very little press but which I think has had a huge impact on cycling is Beech Street tunnel. This tunnel runs under the Barbican and until a year ago consisted of two westbound lanes. It now consists of one westbound lane for general traffic and one for bicycle traffic. 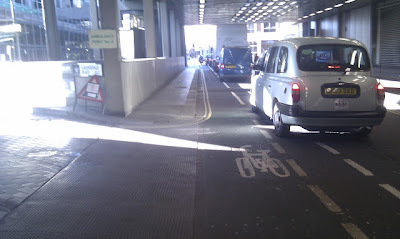 The bike lane runs all the way up the junction at Barbican tube. The City rescheduled all of the traffic lights at the junction with the result that it is better for people crossing the road, there are fewer queues of motor vehicles in the tunnel at rush hour and it is now a significantly safer and easier route for cycling than it has ever been in the past. And one other massive scheme to mention is Holborn Circus. This scheme is being implemented this summer and you can see the details here. It is by no means brilliant. It introduces longer and wider bike feeder lanes into the junction which is good, although not brilliant. And it preserves some sort of two-way cycling down Hatton Gardens (which will become one way for motor vehicles) but with a horribly fiddly shared pavement mishmash that is going to be difficult to use and (I suspect) will be impractical for the volume of people who need to cycle through this way in the mornings. That section of the scheme is technically in Camden and was worked up with the Camden folk. You can see details of the Holborn scheme here and my initial review back in 2011. As far as cycling is concerned, I have a strong feeling that the scheme will need an upgrade pretty soon after it's built. Please come along on Tuesday 2 July. All these points are up for discussion and they need people to come who can talk about them in a constructive way and help the officials and politicians in the Square Mile up their game to become a better place for safe, sensible, easy-for-everyone cycling. Your link to the details of the Holborn circus scheme doesn't work. However, the picture you've included appears to show no cycling provision at all save for advanced stop lines. i.e. the type of poor quality provision which has largely already disappeared on the other side of the North Sea. Please tell me this isn't actually the up-to-date plan for a major junction in a city which claims to be "going Dutch"
Moreover, the present arrangements are extremely dangerous for pedestrians. I think that whenever we examine proposals for new junctions, we should look the impact to all vulnerable road users. Sadly, that's it. Advance stop lines, and feeder lanes. Do feel free to write and tell Iain Simmons in the city (iain.simmons (at) cityoflondon.gov.uk ) exactly how far behind the curve these designs are. Any chance of looking at Moorgate, more road narrowing and with Crossrail work a potential chance to make this much better. The annoying thing with road narrowing is the amount of wasted space which could be used to put in place good quality segregated provision. All this road narrowing just means you have to be in the middle, on the wrong side of the road or on the pavement when blocked by buses. This is simply a joke. When will the City of London planners understand that road narrowing and pavement widening is just going to lead to a massive increase in pavement cycling? Can you please pass on a comment about the (rightly) praised two-way cycling on roads in the City that used to be one-way? In theory, they are great. But they need much improved signage for drivers. I regularly cycle down Crutched Friars (round the back of Fenchurch Street) and have several times nearly been knocked off by taxi drivers coming out of Seething Lane. The problem is that they think Crutched Friars at that point is one-way (so they don't look to see whether someone is coming the other way). There is some signage, but it isn't very visible and the road markings showing that it is a cycle lane have been worn away. Yes, they should be more careful. But they would be helped if the signage was clearer.